This is the "cover page" for a grouping of three pieces of paper. It is 8" x 9 7/8" and a yellowish off-white. This cover page is the back of page 3 (see below) and is a fairly heavy weight, more similar to a cover stock than a letter. The sheet has a watermark: "Symphony Lawn" in a script font. It was folded in thirds, and the fold lines are visible in the scanned image. Pages 1 and 2 are also 8" x 9 7/8" and yellowish off-white. They are lighter in weight, have no watermark, have lines running horizontally across, and are of moderate quality. The three sheets are attached to each other by some sort of glue or paste in the upper left corner. The images of pages 2 and 3 show a diagonal line in the upper left where I folded the preceding page(s) over to make the scans. Everything on these pages is typed with the exception of a few items on page 2, which appear to be in Jean La Forêt's handwriting. 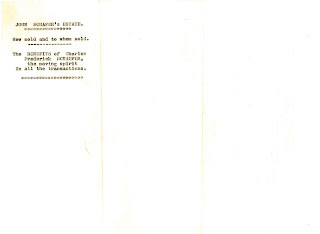 I found it interesting that Charles Frederick Schaefer was called "the moving spirit in all the transactions" on the cover. His name first appeared last July, on the page that had the names, addresses, and spouses of Emma's three half-siblings. He was Louisa's husband. 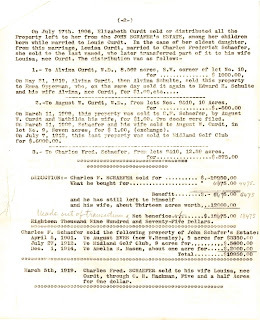 The documents are written from Emma's point of view: "Brother August", "sister Alvina", "my sisters and brother", "my father's Property." That said, I'm not sure if she actually typed them or if Jean did. Based on the papers I've looked at, this seems more his style than hers, and "informations" is something I've seen before from a native French speaker writing in English. Maybe Emma dictated it to him. 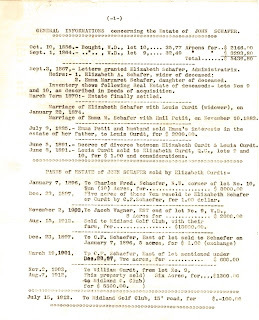 The document begins with a nice timeline of various events from John, Elizabeth, and Emma Schafer's lives. One date not included is the actual day that John Schafer died, but it was no later than September 3, 1867, which is when Elizabeth was granted papers of administration to handle his estate. It took two and a half years to settle his estate, so it apparently was not totally straightforward. 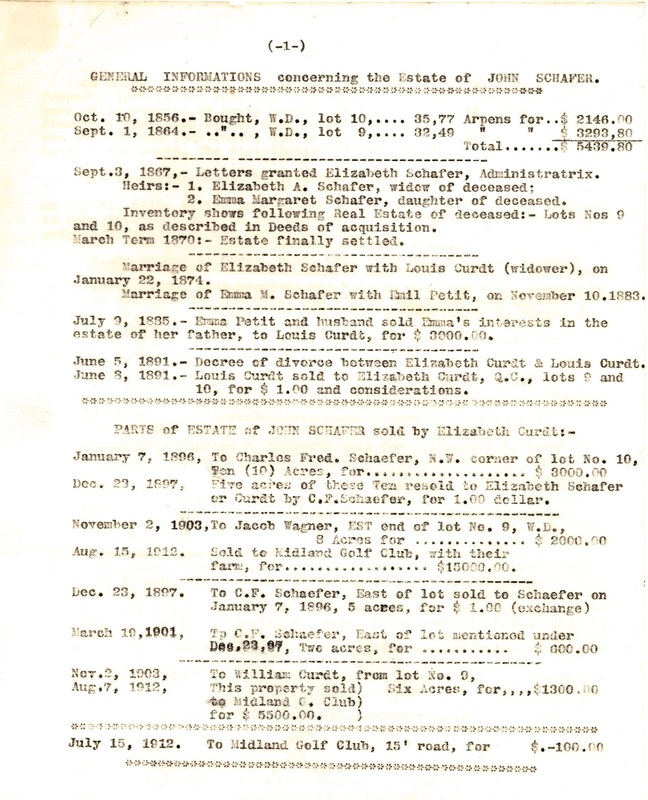 The next few dates in the timeline agree with documents I've posted previously: Elizabeth Schafer did marry Louis Curdt, who was a widower, on January 22, 1874. Emma Schafer did marry Emile Petit on November 10, 1883. I don't seem to have a copy of the document that Emile and Emma signed when they sold Emma's interest in her father's estate, but on July 19, 1885 Louis Curdt signed a waiver attesting to that, so the date of July 9 sounds reasonable. Now I have a date for Elizabeth's divorce from Louis Curdt. 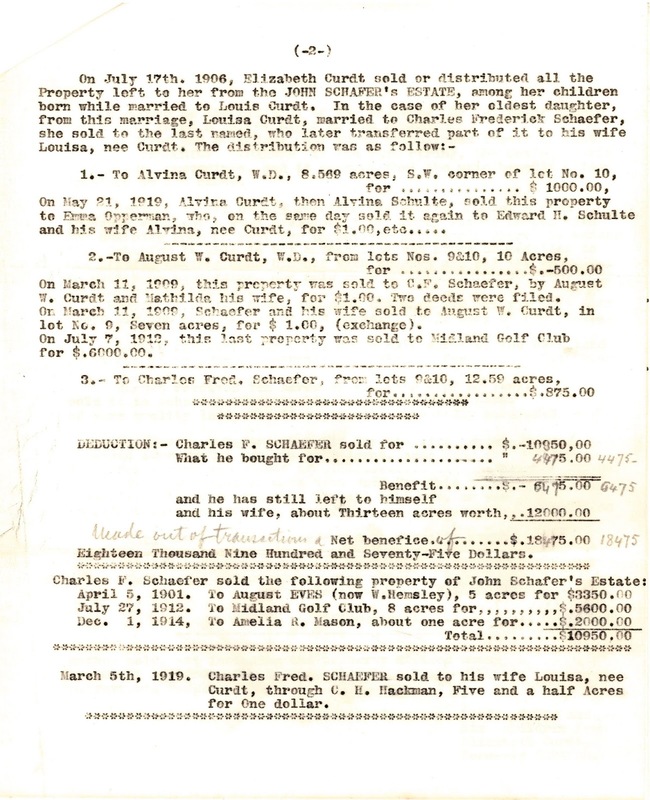 It's interesting to see that the deeds for the land John Schafer had bought were back in Elizabeth's name right after the divorce. 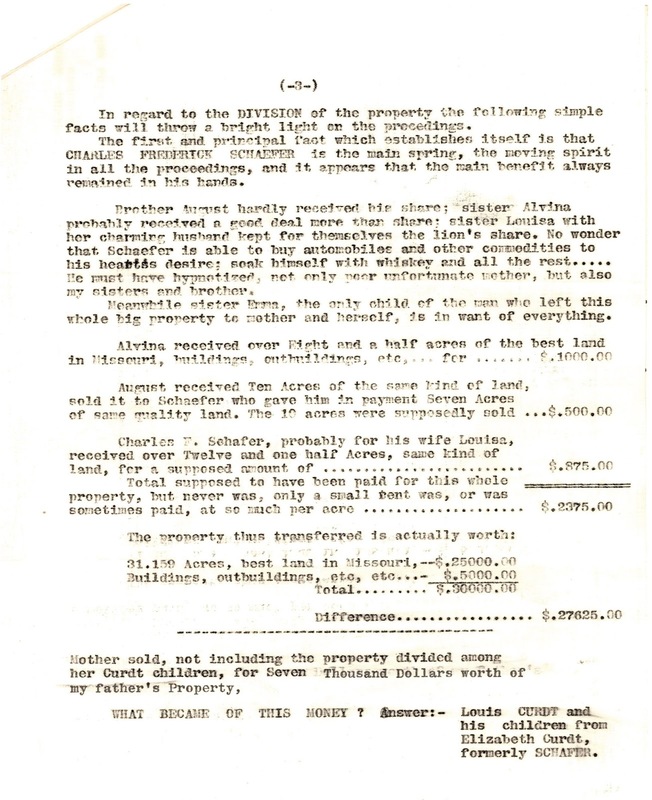 Then we get into the sales and purchases of the land that was in John Schafer's estate. I have to admit, I'm confused by all the back and forth that occurred. I suspect I will need to plat all this out to figure out what happened. 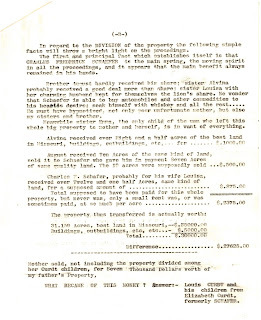 But it does appear at first glance that the Curdt siblings bought a lot of land from their mother at fairly low prices and then turned around and sold a lot of that land for much higher prices. So it seems that Emma was not the only person shortchanged in this series of transactions. Maybe Elizabeth understood what was going on, maybe she didn't. It certainly doesn't cast the Curdt children in the best light. The Midland Golf Club referred to here must be the same one that Jean mentioned in last week's document. I'm not sure how the acreage in these pages correlates with the measurements from the previous one. Perhaps platting will help clear that up also. As for the accusation that Charles Frederick Schaefer benefited the most — well, it's hard to argue that conclusion based on the information on these pages, but I don't know if this is all the information or if it has been presented fairly. Obviously something else I will need to look into after I've processed all of the documents I do have. 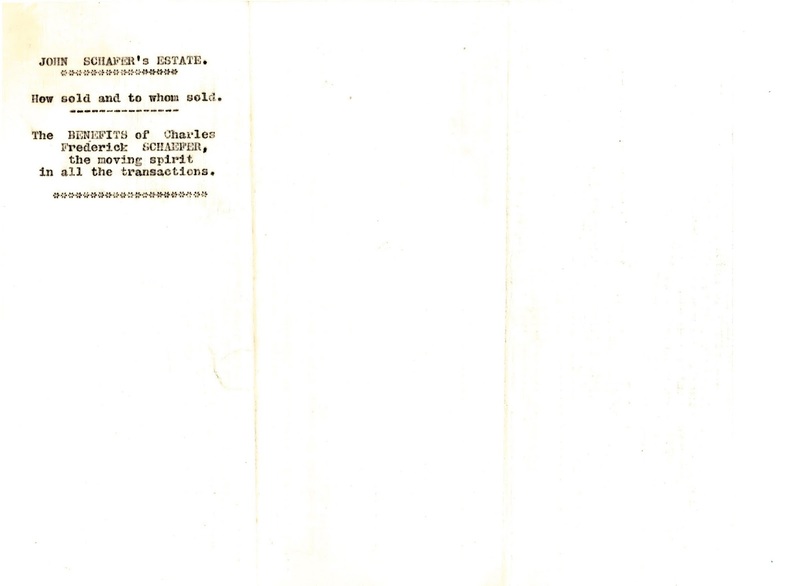 I don't know how easily I'll be able to check on whether Schaefer really bought "automobiles and other commodities to his heart's desire" or "soak[ed] himself with whiskey", but it should be interesting to try. And I'm still wondering whether Charles Frederick Schaefer was related to John Schafer, and whether Louisa married a (perhaps distant) cousin of her half-sister.